Two types of bath toy,Random delivery,so as color.Both design in bright color and smooth surface,approved quality test. Bath toys for kids, includes two fishing rods and six colorful fish with cute appearance,will appeal to little kids. 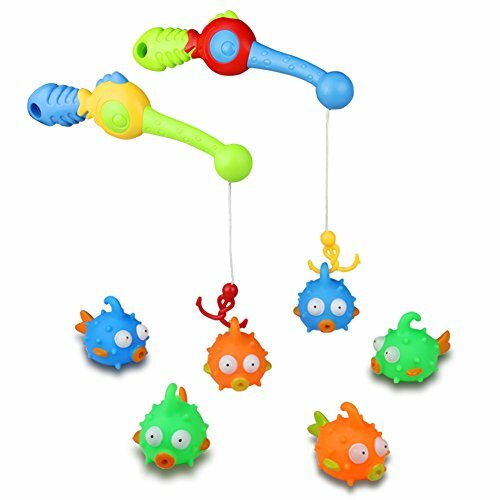 Tub toys,put the fish float at leisure on the water,use the pole with hook to catch them,enjoy hours of fun,help train kid\'s hand-eye coordination. Without magnetic,avoid the coating surface of magnetic part fall off when kids play it for a long time in bath tub,more safely. We promise one year warranty! Your satisfaction is our top priority.If u have any question,feel free to contact us.